Rock 'n' Fall is the first level in World 4 in Yoshi's Island DS. Its name is derived from Rock 'n' Roll. The level is similar to Visit Koopa And Para-Koopa and Lakitu's Wall. To start the level, Yoshi must continuously jump onto rocks that, once he lands on, start to fall. Yoshi cannot stay on the rocks for too long, otherwise he is not able to jump high enough to get back onto the ground, and he loses a life. 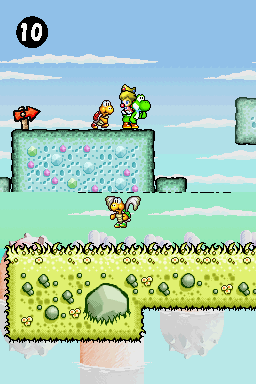 In the second area, Yoshi has to Ground Pound some of the rocks while avoiding enemies in order to continue. In the third area, Yoshi needs to jump on more falling rocks while avoiding the Wall Lakitu. In the final area, the screen starts auto-scrolling. Yoshi must both avoid being crushed by the rocks above him, while jumping on the right rocks beneath him. When Yoshi makes it to the top, the goal roulette appears. This page was last edited on April 15, 2019, at 02:11.